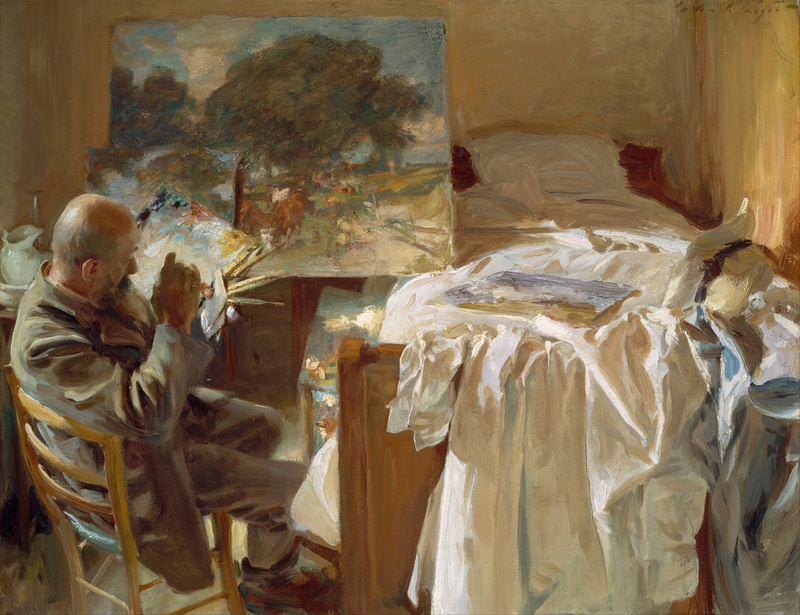 An exhibition of John Singer Sargent's portraits of artists friends has opened at the Metropolitan Museum in New York, and will be on view through October 4. Saw that exhibition in London earlier this year. It was amazing! I know the Met allows photography of most of the museum. Does anyone know if the Met will allow photography of this exhibition? Generally, the Met and other museums forbid photography in special exhibitions. The policy extends to the whole show as long as there is one lender who asks to exclude photos of their single piece. This is regardless of whether other pieces in the show are in the public domain or borrowed from museums that allow photography. At the Montreal museum, they have No Photography signs posted only next to prohibited pieces, which is a more enlightened policy requiring more trust. The Met also officially bans sketching in special exhibitions, which I think is a bad policy. They let you take notes, but not sketch unobtrusively in a small sketchbook. I was there yesterday and plenty of folks (me included) where able to take photos with no issues. The usual 'no's' of taking pics of paintings apply. I thought it was interesting to read how many sitters of his were less than enthused with the end product as far as Sargent capturing their likeness. It seems that a neutral third party is a better judge of whether the artist captured the likeness/essence of the sitter. confirming - i took photos there today. 'the' water color is on display as well.. anyone who goes there will know what i am talking about. also confirming - no sketching ban there. But the museum always reserves the right to stop it if it is very crowded. i was very surprised about both, as this exhibition includes privately owned pieces. granted it is sculpture, but there were plenty of on loan paintings there as well. Tom, thanks for bringing that up. I read Holland Cotter's NYT review, and it was fairly balanced, but ended up suggesting he was a "tool of plutocrats," and that he was passively used by rich portrait patrons. But that's a fundamental misunderstanding of the push and pull that really occurred between Sargent and his official clients. He insisted on autonomy in choosing the costume, pose, and setting for his portraits, and had many rejected paintings (as 19mrscott69 suggests) that satisfied his own artistic ideas for which clients refused to pay. MyPenName, glad to hear that the Met has evolved on this point, because it used to be far less tolerant of sketchers. 19mrscott69, that's good to hear that photography was OK. I suppose with the ubiquity of iPhones, there's no stopping people anymore. "but ended up suggesting he was a "tool of plutocrats," and that he was passively used by rich portrait patrons"
HA! art critics are so full of nonsense (by the way who pays their salaries... 'the people'?. Does anyone really think that the so called artists who get all the press today (e.g. Koons, Damion Hirst, etc) aren't tools of the elite? @ Lucas if you like that portrait, if you're ever up near Western Mass - visit the Clark Museum - of Sargent's best work is there- this painting, his amber gris and some Venice street scenes. If you read some of the JSS catalog raisonne by Richard Ormond you will very quickly realize that Sargent moved in some of the same social circles as "rich portrait patrons" that he painted. They were often his friends. If you think about it, his parents must have been quite well off to be able to come to Europe and stay without working. I think it was more a personal decision for Sargent to do landscapes because they were more challenging and because he like to travel. Also Sargent's paintings were a combination of landscape and portrait, such as "Carnation, Lily,Lily, Rose", and many other paintings done during his stay in Broadway, Worchestershire, England in 1885. No doubt he tired of portrait painting and probably had some demanding, tiresome clients (who hasn't! ) but there seems to be time he genuinely liked it. "If you think about it, his parents must have been quite well off to be able to come to Europe and stay without working." more like a family living on a stipend. The Sargent catalog raisonnes are mostly written by Richard Ormond, a relative of Sargent's. Not interested in an argument here, but I'll take Ormond's word about the family, thanks. Saw this in London a month or so ago - the paintings were fantastic, but we were blown away by the drawings! Phil-there is a good book on JSS's drawings called "Sargent Portrait Drawings-42 Works by John Singer Sargent" published by Dover Art Library. If in Washington, D.C. do not miss the Gustave Caillebotte exhibition at the National Gallery of Art. Incredible! A largely overlooked painter who died way too young rightfully being rediscovered. I've been painting for 50+'years. And teaching not painting per se but seeing and writing about same. Worldwide I visit museums and galleries. Never have I been so pleasantly and refreshingly surprised by an exhibit. Fabulous! Andy Weddington (weddingtonartgallery.com) PS Keep up the great work, James.